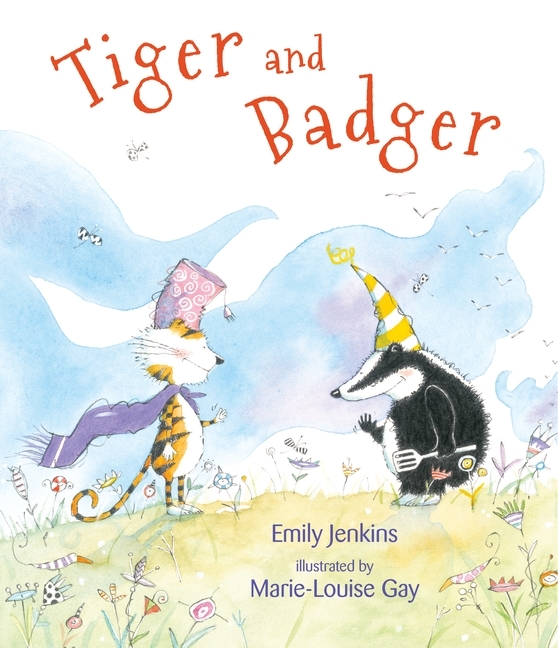 Tiger and Badger, written by Emily Jenkins and illustrated by Mary Louise Gay, perfectly, powerfully presents (in both words and pictures) the intense emotional highs and lows of toddlerhood and friendship in a way I haven't seen before in a picture book. 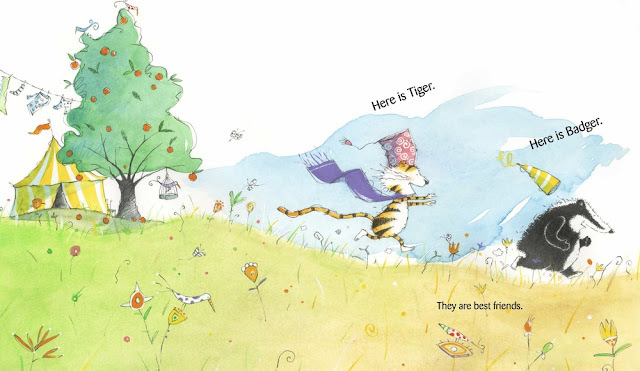 Best of all, there are no adults to stop Tiger and Badger from experiencing these highs and lows and learning to work through them on their own. Tiger and Badger are best friends, enthusiastically so. This enthusiasm can swing from love to hate without much to tip the scales. When Tiger sits in Badger's chair and eats two of her orange slices, they manage to work things out, helped along by the presence of Bad Monkey, Tiger's stuffie. But, when the two decide to take a break from playing to enjoy an ice pop, the scales tip again. There is only one ice pop. The frenzied fight over the ice pop (it IS a red ice pop, after all) is comparable to the Tasmanian Devil taking off. And, in this swirling whirlwind, Bad Monkey gets tossed up in the air and stuck in a tree. Equally concerned for the fate of Bad Monkey, the friends work together to get the stuffie down, but this unity doesn't last long. Another fight ensues and, "Badger hits Tiger. Tiger pushes Badger. Badger pulls a tail. Tiger pounces." Words are said and, "Tiger throws himself on the ground. He is so sad and mad." This has to be one of the truest expressions of feelings I have seen in a picture book and, as someone who has parented three toddlers (none at the same time, thankfully) it rings so true. Badger throws herself on the ground, too, and they both "yell and they yell." Again, such familiar territory. And then, as suddenly as it started, it is over. Tiger stands up to go home and Badger watches him. Then, "Tiger does his funny face" and Badger laughs. 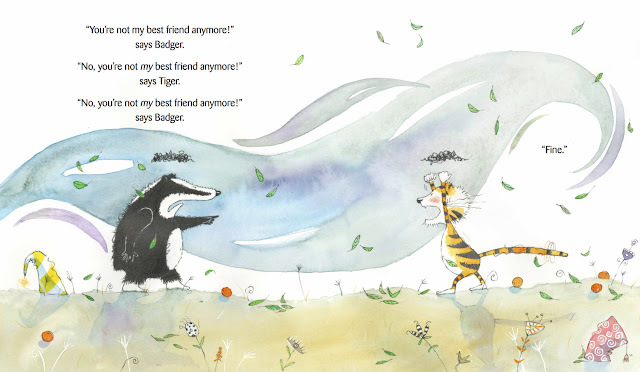 Tiger and Badger closes with these words, "They really are best friends." 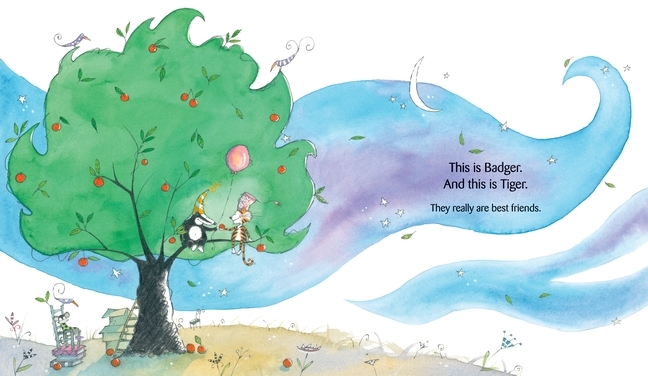 Besides just being a very fun story to read out loud, Tiger and Badger provides so many topics of conversation and in a straightforward enough way to engage a very young child or even a school age child. What I appreciate most about Jenkins's book is the absence of an adult figure. Even the most well meaning adults sometimes step into a situation between children that they might have been better off working out amongst themselves. The beauty of Tiger and Badger is that young readers get to see the two "children" of the story working through anger and jealousy and working out physical and verbal battles on their own.